These days at church we sing all these new choruses and praise songs that are designed to bring us into the 21st Century. I guess they became popular during the Jesus Movement Era and the Charismatic Days. Then they blossomed when the Vineyard started composing it's own music. Historically nothing has changed. Hymns of praise have been written according to the style of a given era. And although music styles change, the message remains the same. Larry Norman sang, "I ain't knockin' the old hymns. Just give me a song with a beat." I happen to love the old hymns. Although my family wasn't particularly interested in church, I gravitated to it. And the magnetic pull was the music. As a seven year old kid, I'd ride my bike up to the local church at 7 pm each Thursday night for choir practice with Mrs. Rief. That's were I first learned two part harmony. I sang with the local Episcopal Church choir throughout high school. And my old buddy Kent Odor's love for hymns rubbed off on me back when we played music together. Music appreciation in school taught me to seek out the where and why behind music. Learning about the composers of our best loved hymns helps to learn why they wrote the words and sometimes the tunes. They had to write them, they couldn't keep their love of God bottled up inside. I thank my sweet daughter for giving me a couple of books about the origin of hymns. The next couple blogs will be about some of the hymn writers and their works. I am starting off with Issac Watts. Issac Watts was considered the father of hymnody. Isaac Watts (17 July 1674 – 25 November 1748) is recognised as the "Father of English Hymnody", as he was the first prolific and popular English hymnwriter, credited with some 750 hymns. Many of his hymns remain in active use today and have been translated into many languages. As a child he was a prodigious poet, to the point that he drove his parents to distraction. His father was a non-conformist. Which meant he did not hold the same theological viewpoints as the Church of England. At that time in history, this was a crime punishable by incarceration. Issac Watts Senior was incarcerated several times during his lifetime for his faith. His son was brought up with the same Christian ideals and held to them throughout his lifetime. Issac was sent to a private school, but was unable to complete his education at Oxford or Cambridge due to his dissenting views. He attended the Dissenting School were he studied Latin, Hebrew and Greek. He left school at age 20 and moved back to his family home. It was there that he wrote most of the work called Hymns and Spiritual Songs. Watts then to a position as pastor of a large independent chapel in London for many years known as Mark Lane Chapel. It was during this period when he wrote many hymns. During his lifetime over 750 hymns were attributed to Watts. "While he granted that David [to whom authorship of the Psalms is traditionally ascribed] was unquestionably a chosen instrument of God, Watts claimed that his religious understanding could not have fully apprehended the truths later revealed through Jesus Christ. The Psalms should therefore be "renovated". As if David had been a Christian, or as Watts put it in the title of his 1719 metrical psalter, they should be "imitated in the language of the New Testament. The practice of maintaining Biblical lyrics in hymns grew from the 16th Century reformation lead by John Calvin. By introducing new poetry into hymns, Watts created a schism that labeled him as a heretic. The controversy grew. Watts health was failing. He moved in with a family named Hartropp. A fever shattered his constitution and a nervousebreakdown breakdown ensued. Watts wrote a letter resigning his position as pastor. His church instead rejected his resignation, lessened his duties by giving them to a co-pastor and increased Watts’ salary. Watts had already been privately instructing the children of a prominent Member of Parliament, Sir Thomas Abbney. Abbney was Lord Mayor of London and though he had to attend The Church of England to keep up appearances, Abbney was a non-conformist. Watts was invited to live with the family to conveless. Upon the death of Sir Thomas, Watts stayed on as a member of the family and lived in a second home of the Abbneys until his death in 1748. 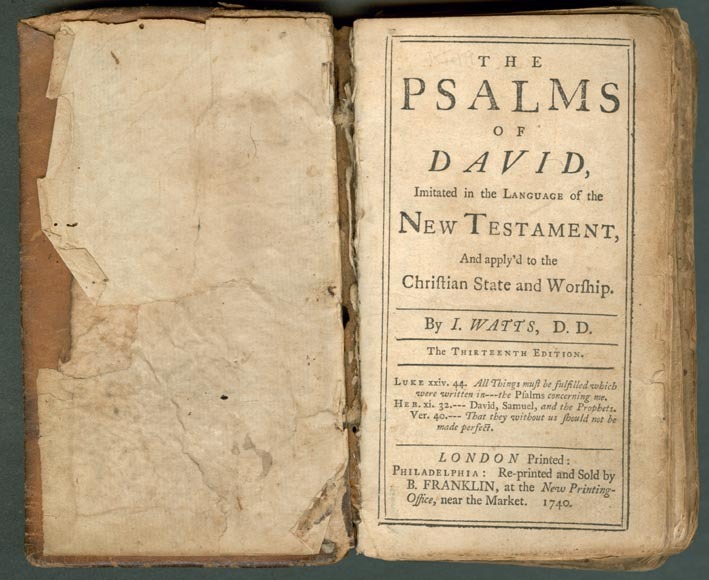 It was during his residence with the Abbney family that Watt wrote a book of hymns based on the Psalms known as The Psalms of David Imitated in the Language of the New Testament. This was a result of the controversy and Watts way of establishing resolve. The works were published and became very popular. In 1728 Watts was awarded a Doctorate of Divinity by the University of Edinburgh. Aside from being a noted theologian and hymnist, Watts was also a logican and author of several textbooks on logic. In fact one of his texts, aptly named Logic, was a standard text at Cambridge, Oxford, Havard and Yale for over a 100 years beyond his death. Look through any hymnal and you will see Watts authorship for many of the hymns that we have sung since we were children. Among my favorites are When I Survey That Wondrous Cross, Joy to the World, Great Is the Lord Our God, Alas! and Did My Savior Bleed, Oh Bless The Lord My Soul. I find it odd that although Watts wrote so many wonderful words of praise in later life joined a Unitarian congregation. Since nothing really changes in life, Watts popularity of the day lead to parody. It may be helpful to know that Lewis Carroll was the penname of Reverend Charles Lutwidge Dodgson who was also an Anglican deacon, mathimetician, logican and philospopher.